From mid-June to mid-October, MCTRS provides a Trail Host to assist visitors with historical and local information about Myra Canyon. This person rides a marked bicycle from Myra to Ruth gates and back each day. 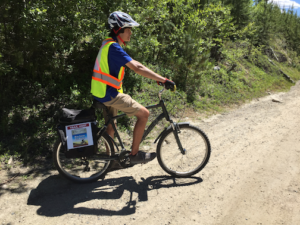 The Trail Host also carries basic first aid supplies and some bicycle tools, and can assist with minor injuries and some basic bicycle repairs. Please look out for the Trail Host and don’t hesitate to ask any questions you have on Myra Canyon.